I had one tonne of firewood delivered yesterday. It got dumped into the driveway and it had to be moved to a more secure and useful spot. Therefore it was up to me and my little helper to move it. I took this photo at 11.36am not long after we started moving it all a reasonably short distance. It’s intense work doing this but I’m so thankful for JJ helping me as it does save me some time. Obviously there’s bits he can’t and shouldn’t pick up but most of it he is able to manage. 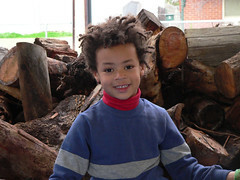 Before he was born, in fact I was 34 weeks pregnant, I had a load of firewood delivered in pretty much exactly the same spot. Due to my stubborn pride and my nesting instinct I moved it all myself. It took considerably longer than it took us yesterday but I did it. Luckily I didn’t go into early labour due to exertion but looking back I should have enlisted the help of some friends. Here’s JJ after we’d moved it all. This photo was taken at 1.02pm so it took us an hour and a half to move all the big bits, and a bit longer to tidy up the rest of the mess. I’m a hard task master and wanted to get it all done in one hit. I could have so easily given in, but that’s not me, and JJ kept cheerful throughout the whole process with only a short break for biscuits and water. Onya mate! In appreciation for our hard efforts we went to the local fish and chip shop and bought a late lunch, came home and watched tv with the fire burning in the slow combustion heater. I love wood fires and the hard work was totally worth it. 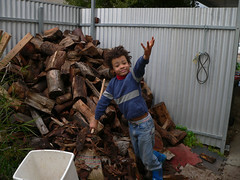 JJ looks like he had a pretty good time helping move that firewood Jen. I’m sure he was a BIG help.